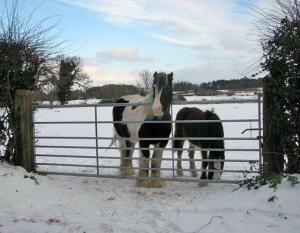 During winter, caring for our horses takes longer thanks to shorter days and poorer weather. Trying to juggle work, home life and horse care is difficult at the best of times, let alone when it’s dark by 4pm and pouring with rain. With this is mind, any time that can be saved day-to-day is definately worth it. If you plan your week in advance, starting at the weekend when you have more time to spare, there will be less to think about come Monday when you are up early and home after dark. When there’s a particularly busy week ahead, speak to your yard mates and see if you can arrange some cover for your horse. It might be that you agree to feed and turn out the horses in the morning, while your friend brings them in at night. Organising your yard and tack room at the start of each week will also make things much easier when you are looking for equipment and preparing feeds. You don’t want to be hunting around for misplaced hoof picks and grooming tools in the dark and wet weather, so make a list of all essential items and where they are kept, and put it somewhere obvious for everyone to see. Some people like to attach brightly coloured ribbons to these things to make them easier to spot in low light. It might be worth making a general checklist of your daily routines for the benefit of anyone coming to help out on your yard. So, what are VioVet's top time-saving tips for equestrians this winter? Try these few simple measures and don't forget to share with us your own! - Horses need to be fed every day, something which is especially important in winter when their bodies are working harder to maintain their core temperature. Hay needs to be on constant offer whether your horse is being stabled through winter (to avoid colic) or turned out (if grazing is particularly sparse). Because these are daily needs, why not bulk prepare hard feeds and haynets so that, should you be in a hurry or have to ask someone to cover for you, feeding your horse can be done quickly and easily, saving time for other things. Note: if you add sugar beet or water to feeds, or if you soak haylage, don't do this in advance as the foods will spoil. - The next thing that your horse relies on daily is drinking water. In cold weather, buckets and troughs can quickly freeze over or get sullied with mud and grass. Carting heavy buckets of water back and forth across an icy yard isn't the quickest or most pleasant job in the world, especially if the taps are frozen and your fingers are seized up with cold. Try wrapping plastic bags around the taps (also works for padlocks!) so they're less exposed and don't freeze up. It is useful to always have a kettle to-hand to manage this kind of problem. First things first, make sure there is plentiful water on offer by filling plastic dustbins with water rather than small buckets. Do this with a hose whenever you have time on your hands and make the water last longer. To stop it freezing over, place a football in the water. The bobbing motion will effectively keep the water moving so that it is less likely to freeze. Note: you might need to secure this to the trough somehow if your horse has a habit of pulling it out. - If your horse is routinely stabled at night, mucking out can quickly become a time-consuming chore. To save time and energy, why not try deep littering? This will mean that, if you are running behind, surface droppings can be lifted out without you having to completely replace the stable bedding. Providing there is enough straw and wood shavings for your horse to rest on comfortably, there is no need to panic if you haven't the time to muck out everything. - When it comes to your horse's bulky stable rug, you don't want to be washing this too often. Think about putting a light summer sheet beneath the rug to collect all the dirt from your horse's coat, as this will be much easier to keep clean. If you can afford it, invest in an additional turnout rug so you can rotate them; no matter how waterproof the current one is, torrential rain can penetrate through to the skin, leaving your horse with a chill. While the turnout rug dries off, it is worth having a spare to put on your horse in the meantime. - Grooming can also be a bit of a nightmare come winter as, no sooner have you brushed off the mud, your horse has covered itself in it again. If you are thinking of investing in a spare turnout rug, consider buying one that extends up the neck. Not only will this keep your horse warmer but it will keep it cleaner, too. Coat shines are another great way of keeping mud from sticking to the coat and maintaining the horse's condition. These can also be applied to the legs to keep mud off, which is a tip worth knowing. Rather than spending ages every week combing through a matted mane and tail, why not plait them? It might only be a simple measure, but it could make all the difference! When it comes to the hooves, it is important to pick them out everyday, particularly when the ground is waterlogged. If you don't, the hooves can quickly form abscesses and Mud Fever becomes a problem. Think about applying Vaseline to the inside of the hooves before turning your horse out; this should hopefully reduce the amount of mud sticking to the soles of the feet.